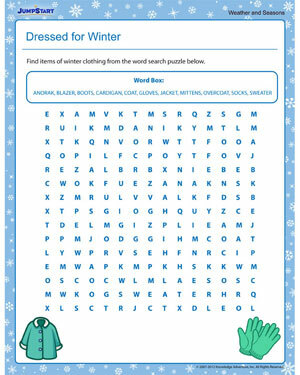 JumpStart’s ‘Dressed for Winter’ is a fun word search puzzle for kids. Here, 11 different items of winter wear lay hidden. Can your third grader find them all? Download this free, printable weather and seasons worksheet and find out. To make the worksheet even more interesting, time the little ones as they solve it.